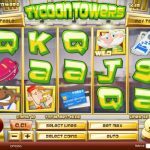 Tycoon Towers is a very traditional slot game. It runs on a conventional payline structure, where you need to receive at least three identical symbols on an active payline. Bet values run from $0.01 to $125 so both beginners and high rollers would find an interest here. Up and down arrows are used to select the number of paylines. 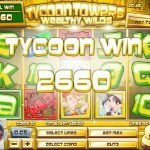 There are five high symbols in the Tycoon Towers awarding between 300 to 600 coins and up to 6000 coins credits in total per payline. Tycoon Towers doesn’t have that many special features worth mentioning besides the Sticky Wilds. Regular wilds can become sticky and remain on the screen for additional re-spins. The Tycoon symbol also serves as a wild and substitute all other symbols. It is also a sticky and will remain on screen as long as winning combinations are created. Tycoon Towers is a cute slot by Rival. It might be lacking a little bit when it comes to extras but it is still fun and the storyline is interesting. Also, this slot is a low-variance so you could potentially play it for hours without loosing your pants. So beginners, this is probably the game for you! it’s simple enough and not at all confusing. Love 5 reel slots? Try Atomic Age, a 5 reel slot by Rival.